There should be absolutely no doubt about it: The outrageous and odious childhood vaccination regimes instituted across the 50 states and territories of the USA are the product of a multi-decade conspiracy on the part of the US Federal Government and its many health-related organs and corporate collaborators. Just who are those many co-conspirators? This conspiratorial group of institutions includes the U.S. Public Health Service, the Center for Disease Control, the National Institutes of Health, the American Medical and Psychiatric Associations, the American Hospital Association, the Pharmaceutical Industry, the Medical Profession, the Health Insurance Industry, the World Health Organization, and the United Nations. When operating in concert to administer the many vaccination programs throughout the nation, these institutions represent a monolithic bulwark known as the Global Vaccination Complex. Other major participants include numerous NGOs and ‘health’ charities, universities and research institutions, private foundations and publicly-held corporations. By way of two exceedingly glaring examples, the Bill & Melinda Gates Foundation and Doctors Without Borders are both huge sponsors of this ongoing plot to profoundly undermine the health of populations around the world. Bill Gates himself has become one of the biggest purveyors of vaccinations the world has ever seen. His foundation “is the largest private foundation in the world” and therefore capable of doing massive damage to whole nations which buy into their distorted understanding of how to maintain optimal health. Each of these aforementioned entities has been brought into an immense worldwide conspiracy to super-vaccinate every child on the planet for health threats real and imagined, engineered and fabricated. Of course, the 64 thousand dollar question is “Why”? That they (NWO globalists) have forcefully, yet insidiously, imposed such a worldwide regime of medical terror and health destruction is without question. Exactly who has perpetrated this crime against the children of the world has been partially established above. “How” they did it will now be disclosed … … … before the “Why” is revealed. In every single case where a new, frightening, highly fatal infectious disease or epidemic has mysteriously appeared out of nowhere, the following MO has been followed with precision. First, the original agent of infection can always be traced back to a U.S. or U.K. or Israeli biowarfare laboratory all of which have been established to create bioweapons of mass destruction. Through extremely advanced forms of genetic modification, various types of pathogenic microbes are specifically designed to trigger a major disease outbreak. Various pathogenic multicellular and micro-organisms (e.g. bacteria, viruses and parasites), fungi, mycoplasmas and the like, are bio-engineered in such a way so as to precipitate a specific medical crisis and/or public health disaster after their surreptitious release into the ambient environment of any targeted locale or community, city or nation. Each ensuing medical emergency that is manufactured in this manner is carefully coordinated to elicit a desired response from the affected populace. Likewise, every burgeoning health catastrophe is meticulously orchestrated according to an explicit agenda. This first piece represents the “problem” in the heretofore infallible “Problem ~ Reaction ~ Solution” formula. By way of illustration, the purpose behind each flu epidemic may be different depending on its location and marked population. Those influenzas which target the Asian Rim countries, for instance, are biological weapons genetically engineered to exploit weaknesses in the oriental bloodlines and Asian genotype. This type of biowarfare against foreign nations has always emerged at critical times in the relationship between the USA and China, as well as between the U.K. and China. The various generations of Avian Influenza (Bird Flu) that ‘originated’ in China are a perfect example of this bioweaponry at work. So are all the yearly flu bugs that have first ‘appeared’ somewhere in the Asian Rim, such as Hong Kong, over the past many decades. It’s interesting that Hong Kong was ruled for over 150 years by the British up until 1997, and yet they (Great Britain) still exert much clandestine control and “soft power” influence over the entire territory. Likewise, the many fabricated flu outbreaks in the USA are always used to serve as a pretext for extremely aggressive nationwide vaccination campaigns. How many times have free vaccinations been made available practically everywhere for every age group and demographic? What else is given away free like that on an annual basis? Anything? Even though the pharmaceutical companies that manufacture the flu vaccines always admit that the exact strains currently infecting the people are not addressed by the most recent flu shot, an extraordinary number of people still avail themselves for their regular jab. How dumbed down must those people be to submit themselves and their children to a potentially harmful injection that does not even contain the proper flu vaccine?!. In the most recent vaccine controversy concerning the measles outbreak in California, the measles virus was quite obviously planted in the most anti-vaccine county in California. How better to scare the other half of the population into compliance? 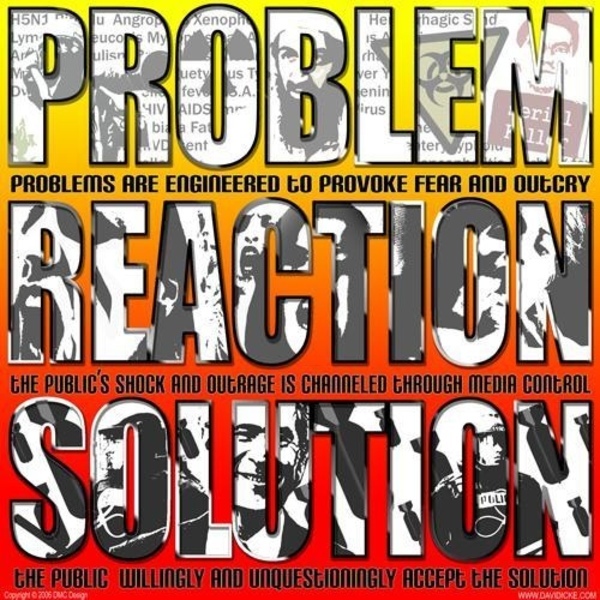 Then, the bought government officials, brainwashed medical authorities, and mercenary corporate provocateurs coordinated the second component of the “Problem ~ Reaction ~ Solution” equation. Yes, the shrieking R E A C T I O N from parents near and far whose children might have been exposed — God forbid! The unprecedented spate of articles and editorials which have overwhelmed the Mainstream Media (MSM) side of the internet is quite shocking, as in “Shock & Awe”. Which is exactly their strategy — to produce an exaggerated reaction. They are literally executing a pre-planned Shock & Awe implementation plan designed to enforce vaccination compliance by every means possible. Not only are they bringing to bear all the usual public health warnings and alerts, they are efficiently using the ginned up peer pressure generated in Orange County where so many entrenched anti-vaxers have drawn their line in the sand. 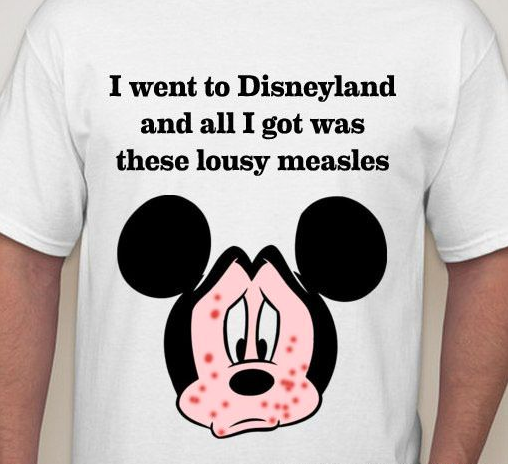 It’s very important to note that all traceable vectors of dissemination of this measles ‘outbreak’ originated from Disneyland in Anaheim, California. Could the true perpetrators of this fabricated black operation have chosen a more symbolic location? That Orange County has always been the site of one of the most fierce and implacable anti-vaccination movements in the nation only adds to the combustibility of this already highly volatile health issue. Which is exactly why the globalists chose Disneyland as ground zero. In order for them to effectively implement their Divide and Conquer strategy they ‘wisely’ selected a battleground where the strongest anti-vax organizations have operated with the greatest efficacy. In this way, if the globalists are successful at shutting them down through peer pressure groups and legal challenges being enabled by new state legislation, their dirty work is done for them. Vaccine exemptions may now be a thing of the past if the anti-vaxers don’t respond with their characteristic fury and ferocity. California has been the epicenter for various healthcare earthquakes since the 1960s. What the pro-vaccination crowd fails to realize is that the rights of those not to be vaccinated cannot be trumped by those who want to poison their children into Autism and Aspergers, ADD and ADHD. For every ailment and disease that Big Pharma conjures up in their laboratories, there has been a reflex throughout society to take the easy and convenient pharmaceutical approach. Recklessly submitting their babies and school-age children to such an obscene vaccination regime is the product of this unenlightened and disempowering annual vaccination ritual. Disneyland, and all that it stands for (healthy children having fun in America) is now emblematic of the war between those who will vaccinate whenever they’re told to, and those who have reclaimed their personal sovereignty over their body and their mind. The corporate-government complex that is orchestrating what is perhaps the greatest battle of this never-ending quiet war is truly laughing all the way to the bank. They really don’t care who wins the ever-intensifying medical debate. The fear-based decision to super-vaccinate already prevails across the nation. However, it remains to be seen whether the anti-vax conviction — that no one is going to introduce toxins/poisons into their child’s body under any circumstances — will succeed on both the legal and legislative fronts. Regardless of which side triumphs, they (Global Vaccination Complex) are well aware that a sufficient number of children will be sickened, diseased and poisoned by so many known toxins that their revenue streams will continue to be guaranteed. After all, the NWO globalists totally control each of the aforementioned entities which make up the Global Vaccination Complex. 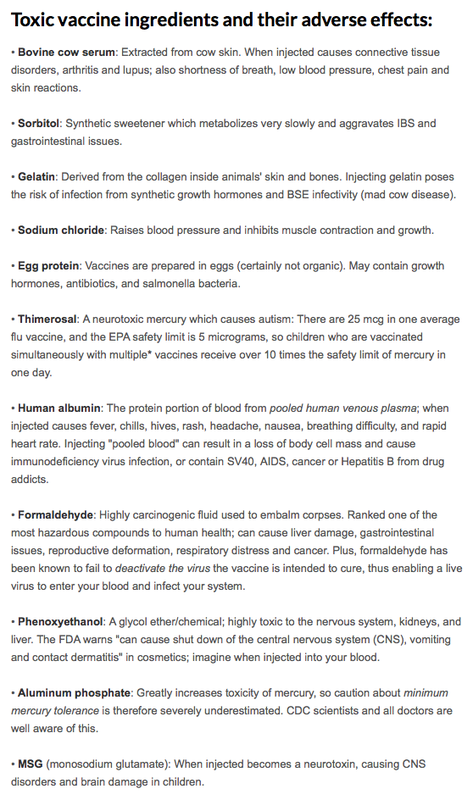 Exactly what are the known toxins and poisons, harmful chemicals and contaminants found in most vaccines? Who hasn’t heard about the preservative thimerosal that contains the poisonous heavy metal known as mercury. How about the known chemical toxin and carcinogen called formaldehyde? Then there is the highly toxic squalene MF59 adjuvant which contributed to Gulf War Syndrome which is now being added to some civilian flu vaccines. Very few are aware but wherever mercury is removed from vaccines, it is often replaced with aluminum, a well-documented neurotoxin that just may be more dangerous than mercury over the long term. Thimerosal, or sodium ethylmercurithiosalicylate, is a preservative used in low concentrations mainly in vaccines, cosmetics, ophthalmic and otolaryngolic medications, antitoxins, topical and intramuscular steroid preparations, and intradermal tests. Thimerosal has two distinctive components, an organic mercury compound and thiosalicylate, both of which are involved in thimerosal allergy. For a more comprehensive list of the problematic constituents commonly found in vaccines, please consult the following ingredient catalog. Bear in mind that this listing is by no means exhaustive since pharmaceutical companies and vaccine manufacturers are notorious for selectively leaving off ingredients at will. At the end of the day, there is really no way of determining what else they may be putting into these detrimental concoctions. Yes, we’re talking about different types of microchips and nanobots. Why are known Carcinogens put into vaccines? Vaccines that contain formaldehyde include nearly all pediatric and adult flu shots; all forms of pediatric and adolescent pertussis vaccines (DTaP and the teen version, Tdap); and injectable polio vaccines (IPV) vaccines. Vaccines given under special circumstances also contain formaldehyde: tetanus boosters (dT, DT and TT), Japanese encephalitis vaccine, rabies vaccines and anthrax vaccine (given as six doses). 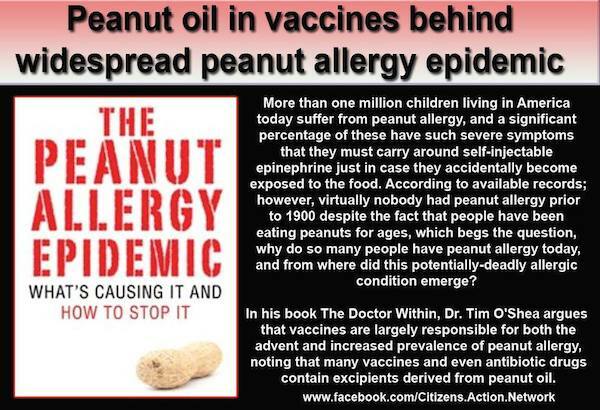 Given the meteoric rise in childhood allergies, why are widely recognized allergens present in the vaccination process? The most common way that flu vaccines are made is using an egg-based manufacturing process that has been in existence for more than 70 years. Egg-based vaccine manufacturing is used to make both inactivated (killed) vaccine (usually called the “flu shot”) and live attenuated (weakened) vaccine (usually called the “nasal spray”). The egg-based production process begins with CDC or another Influenza Collaborating Center providing private sector manufacturers with vaccine viruses grown in eggs per current FDA regulatory requirements. These vaccine viruses are then injected into fertilized hen’s eggs and incubated for several days to allow the viruses to replicate. The virus-containing fluid is harvested from the eggs. There are other constituents in vaccines which can trigger allergic responses when the individual has been sufficiently sensitized. Then there are countless cases which have been reported that reflect either an intolerance or hypersensitivity to the vaccine itself. 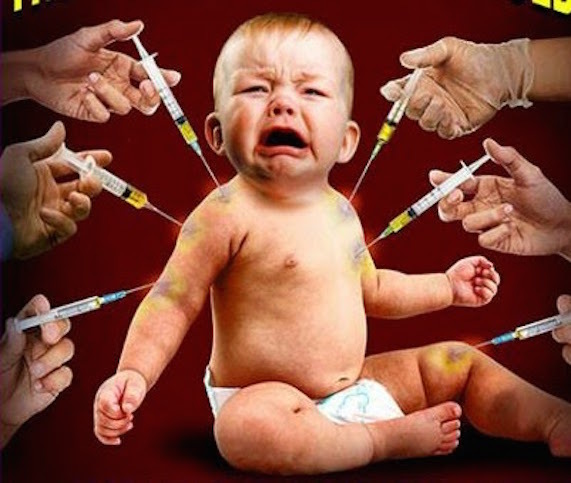 Sometimes these situations will manifest as hyper-reactivity to the vaccine contents immediately following the injections; other times severe reactions can develop in a time-delayed manner. In some cases they are fatal if appropriate medical attention is not rendered quickly enough. There are countless instances where a full-blown disease process has precipitated directly from the vaccination itself. Gulf War Syndrome I and II are both examples of this type of vaccine-triggered disease which the government denied over many years. The deadly combination of various co-factors present among troops who went to Iraq caused the “perfect storm” which has sickened many a service member. In virtually every case it was the extraordinary vaccination regimen, which every American soldier was required to submit to, that seems to have ultimately triggered the Gulf War Illness, as it is also known. The many epidemics and chronic diseases of the 3rd millennium are frequently related to the plethora of auto-immune disorders and syndromes. Known as the New Age Maladies, the third millennium has seen a veritable explosion of auto-immune conditions, diseases and syndromes. The medical establishment has continually and obstinately overlooked the involvement of vaccines with so many of these auto-immune disorders. As a matter of fact, most of the primary care gatekeepers across the whole spectrum of the healthcare delivery system appear to have quite intentionally dismissed the great likelihood of this direct correlation. Surely this goes back to their Med School training which admonishes them never to offend the Pharmaceutical Industry. As glorified pharmaceutical salespeople, many physicians have been hopelessly indoctrinated to believe that BIG Pharma always gets it right, and never does wrong. Many of the alphabet soup diseases, such as AIDS, HIV, CFS (a.k.a. CFIDS & ME), MCS, ALS, MS, MD and many others, fit the profile of vaccine-induced illness. Likewise, the many New Age Maladies like Morgellons, Epstein Barr virus and Mononucleosis, Lupus, Fibromyalgia, Lyme disease, Systemic Candidiasis, Celiac Sprue disease and Gluten sensitivity, Environmental Illness syndrome, Huntington’s disease, Meniere’s disease, Reye’s syndrome, and others also fit the same pattern. The key point here is that the overly aggressive childhood vaccination schedules, coupled with highly invasive vaccines, have served to simply overwhelm the average child’s immune system. Then, later on in life, when the confluence of circumstances is such that stress events begin to cascade, the individual’s immune response is not adequate to ward off the everyday illnesses transmitted throughout the environment or to prevent chronic degenerative disease from advancing. The common denominator for so many ailments and diseases — both chronic and acute — seems to always be past and current vaccinations. These immunizations actually serve as the trigger events which eventually spiral out of control before concretizing as a full-blown disease process or Multi-infection syndrome. This predicament has only been worsening year after year as more intrusive vaccination regimes are introduced throughout society. Multi-infection syndromes (MIS), such as Lyme disease, are quite stealthily engineered so as to genetically mutate over the pathological period of the infection-causing pathogen. In so doing they often mimic other Multi-infection syndromes. In this way Chronic Fatigue Syndrome and Lyme disease frequently have many of the same symptoms. Likewise, no two cases of Lyme disease are exactly alike. Because there can be two or three or four pathogenic microbes operating at the same time, they always produce different sets of symptoms. In other words Lyme disease has been known to morph into 3 or 4 or 5 different generations of various symptomalogical manifestations. Each generation may be distinguished by a different mix of the pathogenic microbes which are well known to define those variant forms of Lyme disease. Not only are the individual microbial strains mutating, the mixes of micro-organisms are also morphing through the seasons and over the years. The more vaccinations any individual receives over the course of their lifetime, the more their natural immune response can be short-circuited. The immunity function can become so discombobulated that it begins to attack its own body. When this condition becomes chronic, auto-immune dysregulation sets in and the person feels like they are perpetually on the fritz. The intolerance and/or hyper-reactivity to vaccines are notorious for sufficiently weakening the immune system to the point of vulnerability to those specific Multi-infection syndromes* which have been fabricated to target their particular genotype and phenotype. This state of affairs can leads to a panoply of health crises and medical predicaments which could have been prevented by simply avoiding the vaccinations. *Multi-infection syndromes are literally designed to target specific bloodlines and genetic blueprints. These syndromes are specifically bio-engineered to exploit the genetic predispositions and/or weaknesses in the heredity of various ancestral bloodlines. Since biological weapons of this nature are now ubiquitous, it is advised that each person put the odds in their favor by regularly strengthening their immune system. Recommendation #1 in this regard is to avoid any and all vaccinations, immunization and inoculations. Their (NWO globalists) medical goal is to make standard vaccinations schedules mandatory for every American alive. Whether you are young or old, healthy or sick, working or unemployed, the government wants everyone receiving their vaccines right on schedule. This is a critical element of their overarching medical regime, and a particularly crucial component of Obamacare. It is actually one of the primary reasons Obamacare was foisted on the nation in such a partisan, unilateral and dictatorial manner. As a matter of fact, legislation is now brewing in California which will make it mandatory for all school-age children to receive the full complement of vaccinations required to attend school … any school, public or private. The following news report indicates the likely repeal of the once sacred “exemption for parents’ personal beliefs” which effectively translates to mandatory vaccinations for all school children — NO EXCEPTIONs EVER! This legislative push is obviously the “Solution” to the “Reaction” which was caused by so much fear-mongering by the MSM. Both the National Press and the California media went into high gear to milk the measles outbreak for everything that they could. The “Solution” was more than likely formulated in the form of a convenient piece of legislation, previously written by the Vaccine Industry, just waiting for its day in the Sacramento sun. That’s where we are right now, folks. If California passes mandatory vaccines into law, it will set a very dangerous precedent for the other 49 states. Which is exactly why this article has been written. Government, especially a rogue and lawless one, should never be able to arrogate such tyrannical power unto itself that it can force toxic vaccines on the citizenry. The delicate, vulnerable and still developing bodies of infants and young children are particularly sensitive to the injurious chemicals and contaminants put into vaccines. Until their safety can be proven beyond a shadow of a doubt, the onus of responsibility lies with squarely on the shoulders of government regarding any legislation which mandates vaccination. In the absence of any objective and high integrity science demonstrating their safety, vaccines ought to be completely removed from the healthcare arena, as well as the general marketplace. There is simply far too much anecdotal evidence coming forward every day which connect vaccines to a whole host of serious medical conditions and health complications … up to and including death. Sudden infant death syndrome (SIDS) is just one flagrant example of where newborn infants are exposed to vaccines at a very tender and vulnerable age. While there may be different causes of SIDS, there is a plethora of anecdotal and circumstantial evidence which points directly to the overwhelming regimen of vaccinations that most babies are subjected to. 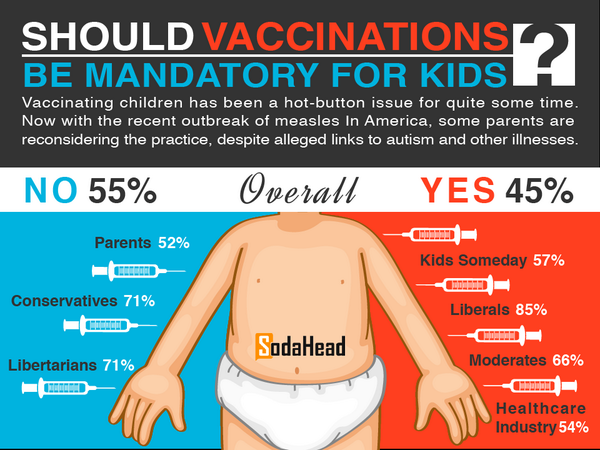 In the USA children receive “49 DOSES OF 14 VACCINES BEFORE AGE 6“. More significantly, the child will receive 35 of those doses by his 18th month of life. Now you know why “Doctors are trained to deny any evidence of vaccine linked to Sudden Infant Death Syndrome“. For concerned parents, it should especially be noted that the first vaccine given to infants almost immediately following their birth is for Hepatitis B. The administration of this completely unnecessary vaccination has been determined to cause SIDS. Injecting babies with Hep B is perhaps the most misguided and ill-advised OB/GYN practice there is. Many a baby has certainly died from this inoculation and the parents were left wondering why … because the physicians always play dumb. The direct correlation between these profound chemical assaults (delivered regularly via vaccination schedules) and disorders such as Autism and Aspergers, ADD and ADHD is now firmly established by those medical researchers seeking the truth. The autism-vaccine connection has been so thoroughly documented scientifically in Italy that the courts have “awarded compensation to a boy for vaccine-induced autism”. What is most curious about this extraordinary finding is the total U.S. Media Blackout. Autism is not to be taken lightly just because it has become so common in the vaccine-happy countries of the world. Autism Spectrum Disorders are now so commonplace that some TV programming regularly refers to the prevalence of Prozac and Ritalin prescriptions among teenagers, and now young adults. The following disorder description is due entirely to the out-of-control vaccination regimens nationwide. What is particularly alarming about the appearance of these various forms and levels of seriousness of autistic disorders is their intensifying emergence over the past 60 years. With each successive decade since the 1950s, both vaccination regimes and the incidence of autism have increased practically in lock step. This one-to-one correlation can no longer be denied. That physicians reflexively dismiss such obvious linkages should no longer be tolerated. They do, after all, take the Hippocratic Oath which includes the vow to “First, Do No Harm“. Because of the extraordinary threat that his research posed to the entire medical establishment and beyond, he was maliciously maligned in an attempt to discredit his vital work. In the end, his courageous stand for the truth, and the extreme reaction by the Global Vaccination Complex, clearly demonstrated just how much legal risk and financial liability exists under the current rubric of the Global Vaccination Complex(GVC). The “Doctor” that we know and who many worship today would be completely disgraced — in a heartbeat — were the truth to be told about the “Barbaric, Insane and Fraudulent” vaccination regime that predominates across the land. As a professional group, they have taken advantage of the trust and confidence that families and individuals everywhere place in them. Therefore, it is critical for the anti-vax movement to go after this weakest link in the Global Vaccination Complex chain. If the docs refuse to be educated, then they ought to be refused the important business of overseeing your family’s health and medical needs. They (the NWO globalists and GVC) now know that we know. They have been running a game — a thoroughly repugnant and nefarious game — of death and disease … and the relentless destruction of human health. 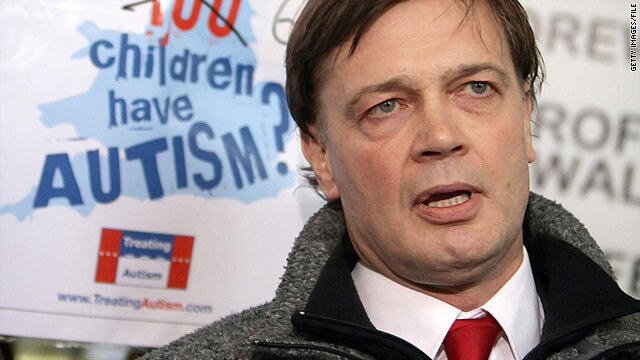 Autism is just one of the many pervasive and disastrous health outcomes for Western society. It has taken a terrible toll on whole generations, getting more serious with the later ones, especially the Millennials and Generation Z. Once everyone has completed their crushing regimen of childhood vaccinations, the public health officials see to it that they are then kept in the vaccine groove by way of the annual flu shot … for the rest of their natural life. What a thoroughly oppressive system? The flu vaccine is now foisted on people in every sphere of life. The barrage of advertisements and subliminal messages during flu season is as offensive as it is astounding, yes? Clearly the intention here is for the Global Vaccine Complex to capture each human being from cradle to grave. In this way they can be subjected to the most recent advances in microchipping technology(a.k.a. RFID). They can also be used as guinea pigs to test “new and improved” ingredients as well as different mixes of those ingredients. Their primary care physician is essentially conducting an ongoing perfectly controlled quasi-clinical trial. He catalogs each illness and every condition which arises with each subsequent visit to every flu shot. The health insurance companies are also in the loop by virtue of sharing the same medical information highway regarding flu shot history and documented complications. Since the patient’s medical data and health information are always shared with the government due to the requirements of Obamacare, Medicare, Medicaid and TRICARE, the CDC, NIH and Surgeon General are also kept in the very same loop. These and other inter-relationships ensure a smooth and seamless exchange of privileged and useful information about changes in broad demographic medical patterns, as well as in any given individual’s health status. In spite of a tremendous degree of professional resistance against institutional flu vaccination programs, they have been insidiously instituted wherever possible. Protest movements within the healthcare industry have done little to slow down the momentum. When doctors and nurses question the efficacy and safety of flu vaccines, you know something is about to break wide open. How often are such prominent political luminaries such as President Barack Obama, Hillary Clinton, Governor Chris Christie and Senator Rand Paul all purposefully drawn into the vaccine debate? You know that when such a sensitive topic reaches this level of the public discourse something very big is afoot. The Mainstream Media is always used to further implement the “Problem ~ Reaction ~ Solution” MO. Exactly what the larger agenda is behind the recent media circus around vaccines is quite transparent. Each candidate is being given an opportunity to weigh in on this exceptionally weighty matter. To a great extent it will determine their ‘fitness’ to serve their new masters in the capacity of POTUS. The two camps are clearly well defined by their uncompromising anti-vaccination posture or their tough pro-vaccination attitude. There is no question that such a stance will greatly influence the outcome of the 2016 presidential election cycle. Either We, the People will secure their right to choose what is good for our health, and right to introduce into our bodies … or the government decides that. In any event the next presidential election will prove to be the one that determines the extent to which personal sovereignty will reign supreme, or will not. Similarly, the notions of states’ rights and national sovereignty are also shaping up to be major issues as the U.S. Federal Government continues to run its tyranny on the American people. Running roughshod over the U.S. Constitution is now a deeply familiar issue to every American citizen and The Vaccine Conspiracy may very well bring it all to a head, once and for all! Now we come to the “Why?” And who really gains. There are many levels throughout this massive and mind-boggling vaccination conspiracy. Likewise, there are multiple layers within each of the major levels. Each institution and organization has its own set of intentions as well as specific agenda regarding vaccines. Every individual within the Global Vaccination Complex system has their own part to play and will design their operating plan accordingly. Nevertheless, the same basic MO (method of operation) is utilized by all the major players, which then filters down to those who execute the implementation plans. (i) False claims of faked successes are fraudulently made about all the previous vaccination programs. (ii) Adamant denial of any and all correlations between vaccines and disease and/or deaths is employed by every stakeholder, bar none. (iii) Scare tactics are predictably used in the wake of every flu outbreak or infectious disease epidemic which promote vaccination. (iv) Each component of the Global Vaccination Complex closes ranks with each other because of the massive liability — both legal and financial — which every stakeholder is exposed to once their scheme collapses. (v) Pro-vaxer are always presented by the MSM as sane and rational; anti-vaxers are portrayed as wild-eyed conspiracy theorists who subscribe to this quite transparent conspiracy. Yeah, but “Cui bono?” Who really gains from such a complex, convoluted and crazy conspiracy? Certainly not the children! Truly, this very same game has been played for eons. It always pits those who control against those who are controlled. The enormous amount of power and money associated with the Global Vaccination Complex is staggering. Therefore, it is easy to understand the degree of control which can be exerted on any given population that is subjected to such a regime of yearly jabs. The operative word here is CONTROL. Whether that control becomes further expanded or hardened by means of highly advanced microchip technology via nanobots and brain chips can only be surmised. The very fact that an “integrated circuit (IC) chip is as minute as a speck of dust” indicates that just about anything is possible at this late date. Therefore, the opportunity for the globalists to exert even more control over vast populations has increased exponentially over the past few years; perhaps even over the past few months or even weeks. Why is exercising even more control of such importance to those who already completely control the whole Earth realm? That’s an exceedingly relevant question during the years of 2015 and 2016, and it will be addressed in Part II in this series on the “THE VACCINE CONSPIRACY”. There is now irrefutable proof that vaccines cause Autism, Auto-immune disorders, Sudden infant death syndrome, Multiple chemical sensitivity, Environmental illness syndrome, mini-strokes, food allergies among many other diseases and illnesses. And, yet, the medical doctor of today continues to evade and obfuscate, dissemble and deceive their trusting patients … … … like sheep taken to the slaughterhouse. Can it be a mere coincidence that Bill Gates, the cofounder and past president of MICROSOFT, went from working with computer chips to vaccine chips practically overnight. How convenient was that transition?! From playing with computer hardware and software to playing with human bodies and minds. Clearly, his was a transition that only makes sense when looking through the lens of “The Global Vaccine Conspiracy”. The Bill and Melinda Gates Foundation spearheads many of the vaccination initiatives and immunization drives throughout Third World nations. In that capacity Bill Gates’ foundation plays a pivotal role in the vaccination of the children of the world, as well as the immunization of many adult populations in Africa and Asia and South America. Very few NGOs or nonprofit foundations occupy the catbird seat of the Global Vaccination Complex as does the Bill and Melinda Gates Foundation. Nearly 200 countries around the globe have endorsed a shared vision—known as the Decade of Vaccines—to extend the benefits of vaccines to every person by 2020 and thereby save more than 20 million lives. This international collaboration has generated the Global Vaccine Action Plan (GVAP), a framework for preventing millions of deaths by 2020 through more equitable access to existing vaccines for people in all communities. 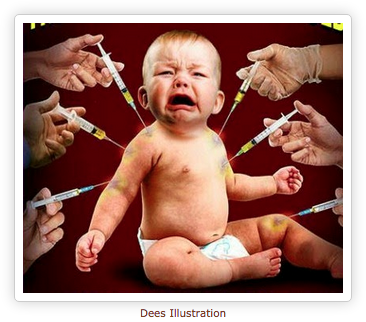 Is a forced vaccination agenda behind the measles hysteria? 49 DOSES OF 14 VACCINES BEFORE AGE 6? 69 DOSES OF 16 VACCINES BY AGE 18?